There seems to be a novelty print love resurgence happening right now, and rightly so! I started getting into them..... well, when I realized they existed about a year ago, and I've been hooked ever since! Basically, what I'm saying is: don't just buy any random novelty print just because it's a vintage fad. Buy the prints that you truly love and express yourself with them! You have the ability to visibly demonstrate something about yourself in a way that nothing but a novelty print can really offer. (Who says, "Wow, she must love music, look at the shape of that skirt!" No one.) Use this to express what is unique about you! If you could find/have any novelty print in the whole world, what would it be and why? Oh! That Hieroglyph dress! I'm dying! However it's just a wee bit too small! Darn! 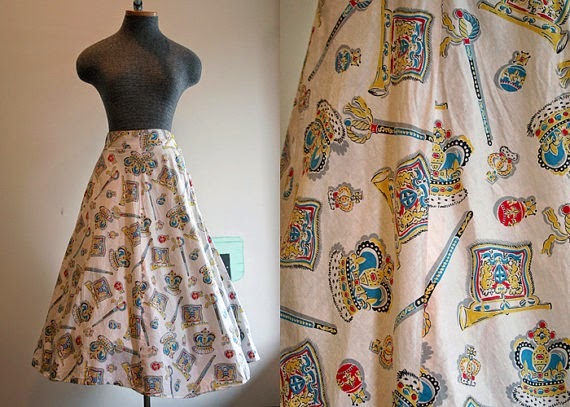 I shop all the time at Wanderlust, the shop that has the royalty skirt, so I've seen it in person, and it's super adorable! And what a question to pose to your readers! Oh gosh! So many! Vintage car travel maybe? Like route 66? Of course cowboys, Native Americans and Mexican and Egyptian too. Ha, yeah, it is a hard choice to pick just one. So.... yeah, I'll go with what you did and accept a top five or ten! And I KNOW, the hieroglyph dress is amazing! It's too big for me (and pretty expensive, to boot), so it's sad all around. I actually just read that post, and it's fabulous! I'm coming to much the same conclusion that you are, that fun pieces really do bring life to a wardrobe! 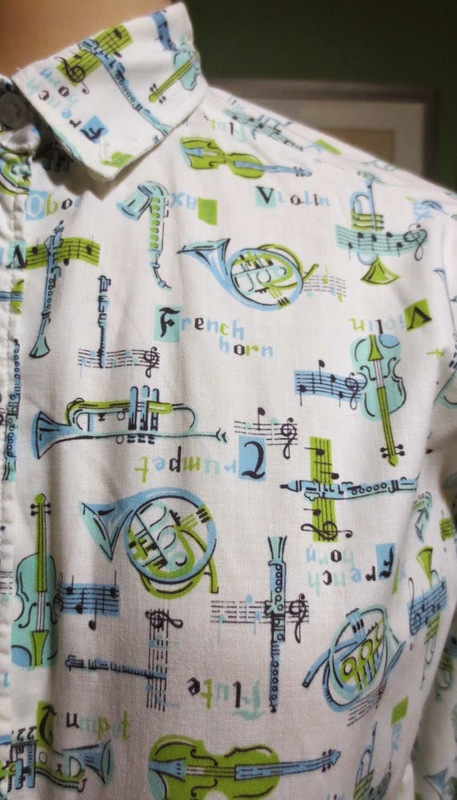 I've noticed a lot of bloggers talking about novelty prints lately too. It isn't something I've seen much of before. 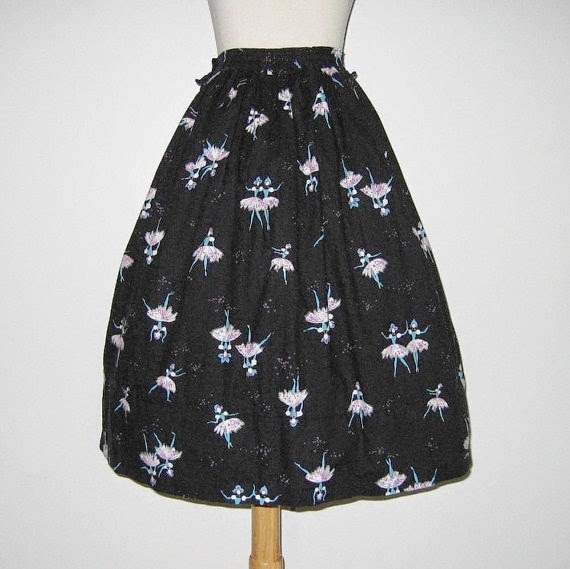 I think I would like ones that feature some of my favourite unusual animals (on which note, I just found an Okapi print fabric that is fabulous!). Also, I have a Groucho Marx print shirt, and I have yet to see any other Marx Brothers fabrics, which I think is a shame! An OKAPI print?! How awesome! And a Groucho Marx print? That sounds pretty awesome. Do you have a picture of it anywhere? That is AMAZING! Mend it soon and wear it all the time! I started collecting novelty print skirts 10 years ago, and I'm glad I did because now the prices are crazy! I love travel themed prints, and I'm still trying to find a great London themed border print. Novelty prints are going for crazy prices now. 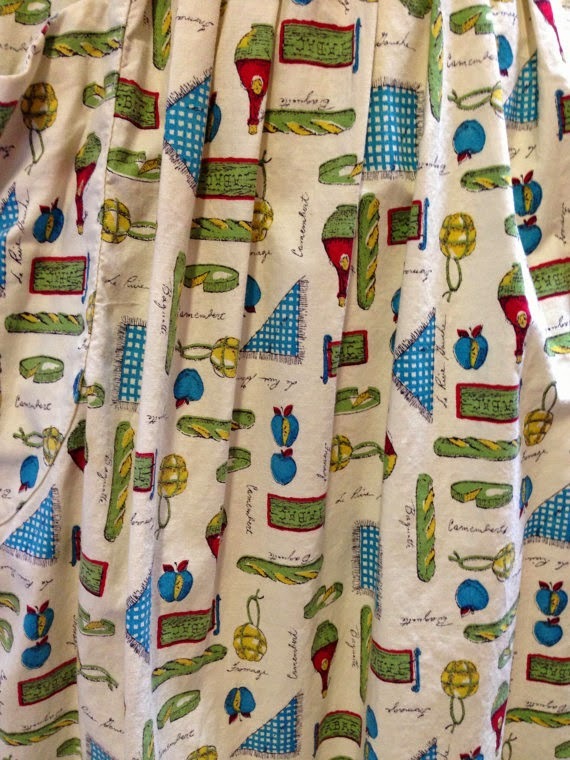 There are a couple I have paid crazy prices for too:) Like a "Love Letters" skirt. I bought it probably a year ago because I just loved the print and didn't know when it would show up again, but it has shown up again at a cheaper price:P But, oh well, I figure it all evens out. I just also got a "Love Letters" skirt in a different color. I would love a novelty skirt of Paris and Vegas because these hold special places in my heart. The thing I like about certain novelty prints is that they are like walking works of art. I would have majored in art history in school if it would have paid the bills:) They are so much fun and so interesting to see all these prints. 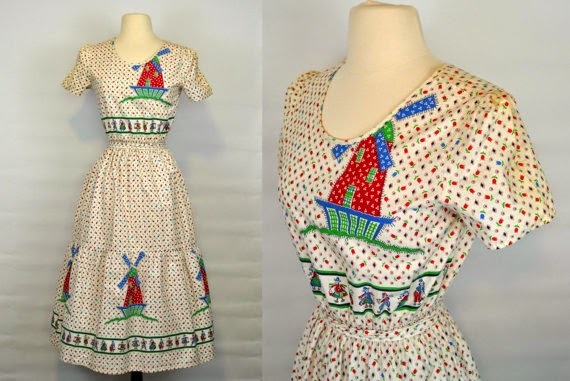 Also, 1940s rayon novelty prints are very expensive now. 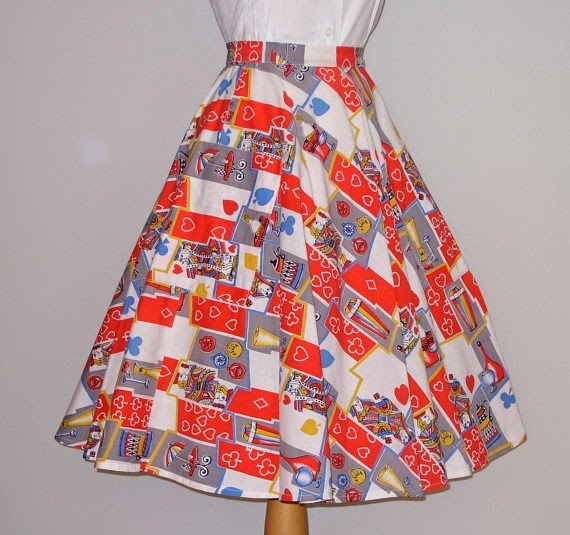 I find I can still get a 50s novelty skirt for $50 or under but not rayon novelty dresses:) Great post! True story, the 40s rayon prints are CRAZY. But I love them. But it has to be from afar because of those aforementioned crazy prices, haha. You're very right, and I agree; certain novelty prints (especially the ones created by actual artists) ARE works of art!